The word “depression” itself was first used in medical context in 1856. However, “Since Aristotle, melancholia had been associated with men of learning and intellectual brilliance, a hazard of contemplation and creativity. The newer concept abandoned these associations and, through the 19th century, became more associated with women.” (Source: Wikipedia.) Even if Gunnar knew the word, he wouldn’t use it to describe himself. It was women who got hysterical or depressed or whatever it was that women did. Men had to deal. It didn’t matter how or whether they were even able to. Depression uses the fact that he can’t deal with it to make him more depressed. After all, what kind of man feels like this? 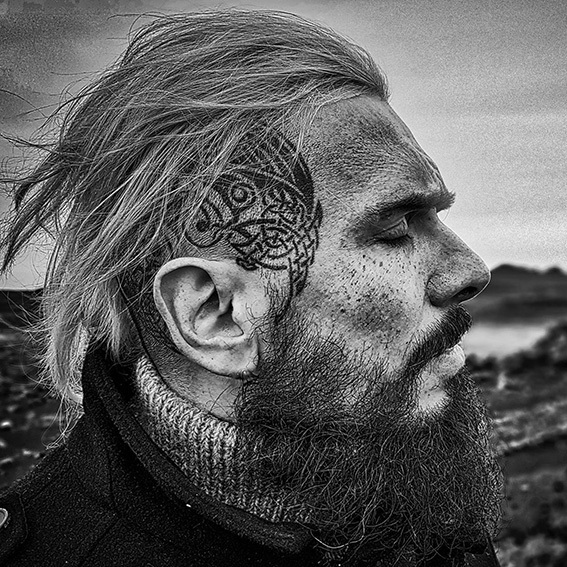 When an Icelander lost a parent or a child, back then, there was no time for grief. You couldn’t afford it – literally. There was work that had to be done if you wanted to eat. Crippling depression turned you into a useless mouth to feed and nothing else. 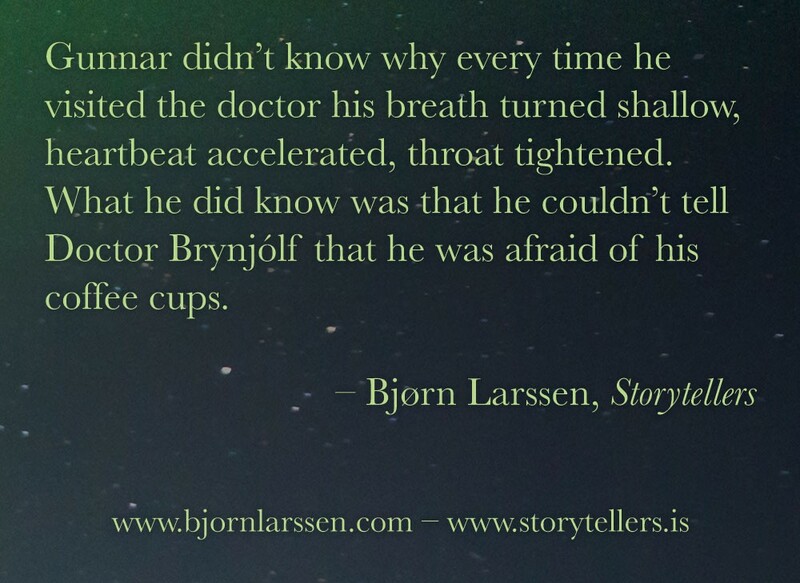 One of the reasons why Icelanders were a nation of writers and storytellers was that often those were the only ways for them to express feelings. A mother who lost a child would continue doing what she had always done, because she had to, then spend the evenings or nights writing heartbreaking diaries or letters to the child that was no longer there. Gunnar doesn’t write. 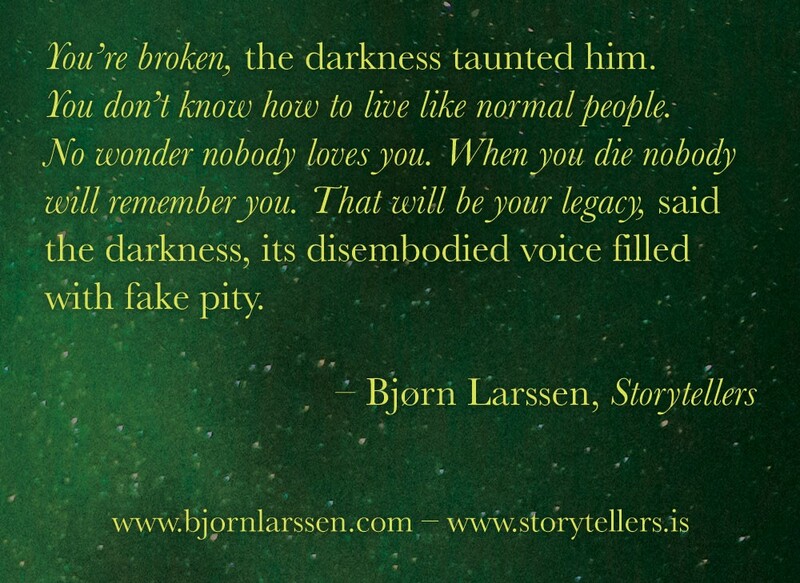 He just feels broken, and one of the most dangerous parts of depression is that it makes you believe you are broken, happy to repeat it over and over and over, creating a downward spiral. Depression is like a virus that doesn’t care whether it kills its carrier. When Gunnar goes shopping, his brain immediately gets into the whirlwind of “what ifs”. What if they think things about me? They act like they like me, but do they really? What do they say behind my back? What if I break something, say something stupid, what if I attract attention, what if nobody notices me, what if everybody notices me, what if I drop this porcelain coffee cup? The anxiety doesn’t answer any of those questions. It just piles them up. Don’t touch the tablecloth, Gunnar, you’ll make it dirty. Don’t lean back on this chair, you’re too heavy. Don’t sit like this, you look stiff and nervous, they’re looking. Uh-oh. You said things were good, but maybe they didn’t believe you, say it again, louder, say they are “very good”, but why are they staring now? What are they thinking? Should you say it again? Shouldn’t you have said it at all? Drink the coffee, otherwise they’ll think you’re rude. Don’t touch the cup, or you will break it and they will…what? At its peak, anxiety doesn’t even come with any particular thoughts or predictions anymore. “Something bad is going to happen” is all that it’s willing to tell you. You ask, desperate, “but what is it?”. Anxiety rolls its eyes at your stupidity and clarifies: “S-O-M-E-T-H-I-N-G”. It can be terrifying to admit this to a doctor in 2019 (“what if the doctor thinks things about me? what if the doctor thinks I’m making it up? what if the doctor tells someone? what if…”) – and in 1920 the term didn’t even exist. In the 1930s, the phrase “social neurosis” made its first appearance in psychiatry. Can you imagine an under-educated, anxious blacksmith going to a doctor and declaring “I believe I have social neurosis, which by the way wasn’t invented yet but it will be in a decade or two”? Me neither. In 2019, I’m lucky enough to have words to describe it, but not enough – not yet – to eradicate it from my life. I also happen to have very high IQ, which causes me an extra problem, as depression feeds on the fact that I can’t outsmart the anxiety. A lot of memes about introverts repeat the same stereotypes. We love to stay home, cancel plans, cuddle with a book, pretend we’re not in. Aye, we do all those things. But it doesn’t always mean we actually choose/want to do them. Back in the day when I was young and, er, lively, I used to go to parties of various sorts. I’d have a few beers, dance, chat with people I knew. I’d also keep looking at my watch. Has it been two hours? Because once I’ve been here for two hours I can leave. Everyone will have noticed I came. And I can then go home. I never said goodbye to anyone, because I knew from experience some of the people would try to stop me from leaving – or, worse, start another conversation. I just slipped out, unnoticed, relieved. At that time I had no idea social anxiety existed. In any case, it couldn’t possibly have applied to me. I was just an introvert. I just liked to cuddle with books and stay home. As years passed, my condition developed to the point where I started to have to cancel plans and pretend I wasn’t in. Believe me when I say there’s nothing enjoyable about having tickets to a concert you’ve been looking forward to for months and not being able to leave the house. Feeling sick when your phone rings and it’s an unknown number, which means there could be anybody on the other side and what could happen? S-O-M-E-T-H-I-N-G, that’s what. Gunnar’s social anxiety diminishes the moment attention is very clearly focussed on someone else. It is only then that he can stop worrying what people will think if he (insert a completely random verb), because those people don’t notice his presence – which, paradoxically, makes him able to stop trying to become invisible. He uses his special medication, which helps, until it no longer helps and more attention is being paid to him. 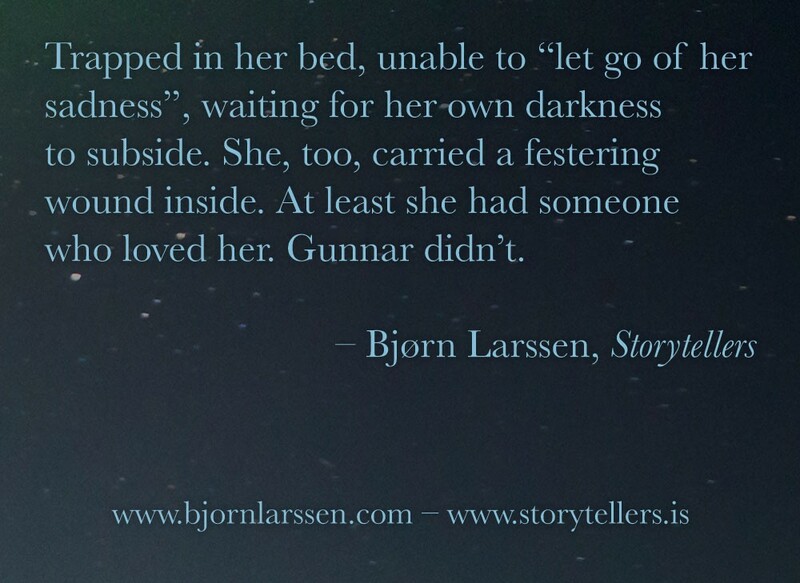 People around Gunnar have good intentions, they come up with plans how to fix him, make him happy. They don’t bother asking, because it’s clear Gunnar is unhappy, so he must be told what to do. Find God in his heart. Work more. Work less. Get married. Become normal. They say that every first novel is autobiographical. I wish I needed to do more research on this topic instead of writing what I know too well. 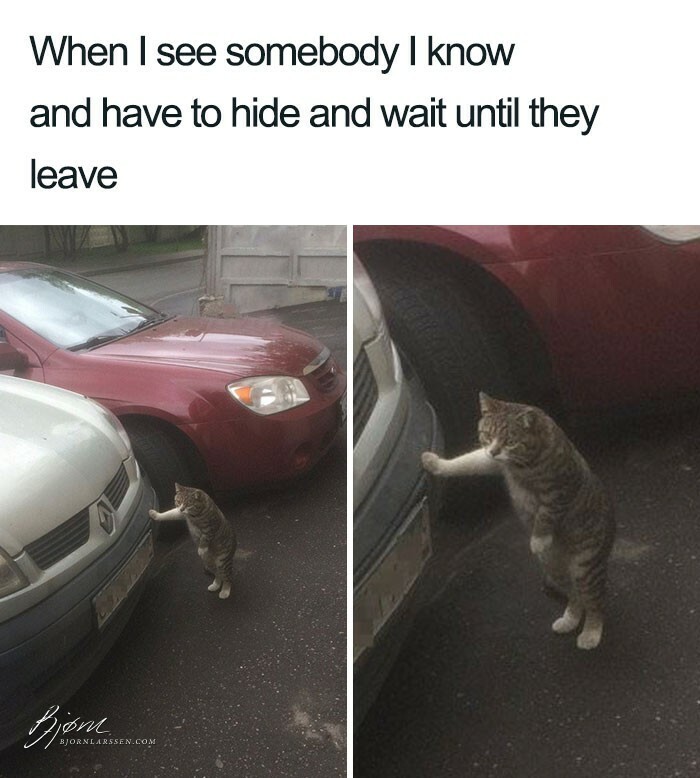 Image: “130 Funny Memes That Will Make Every Introvert Laugh Out Loud”, Bored Panda. Ha ha? Previous Previous post: Do you have Viking blood?